Last week, Year 10 students took part in the second of a series of university workshops being delivered across all year groups at Bridgnorth Endowed School. The session tackled university fees, finance and personal statements in a move to raise aspirations and uncover the myths around these topics. Jon Cheek, from UniTasterDays, returned to follow up on the initial workshop, Key Facts About Higher Education, which looked at courses on offer and the university application timeline. 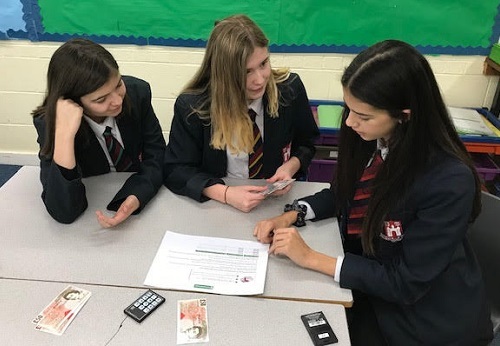 To get to grips with the financial aspects of university, pupils worked with plastic money to guess how much student loan repayments would be, based on potential future earnings, then used response clickers to vote on potential earnings in relation to various university subjects. As a key part of the university application process, the workshop went on to explore personal statements, which present students with the challenge of summing up their skills, experience, and ambitions, using just 4000 characters. During the workshop, students were shown real examples of personal statements and given some helpful tips to start to consider their own. UniTasterDays is a provider of aspirational university talks for schools throughout the UK, and will be working with all year groups at Bridgnorth Endowed. Sessions are delivered to small groups, to ensure students have the opportunity to ask questions and participate in the interactive activities.